Experienced Goldtrowel qualified and certified plasterer. All Aspects Of Plastering Undertaken. Renew ceilings, Dry-lining, Skimming, Coving, Internal/external rendering. Skimming over artex. Repairs, Making Good, Floor Screeding, Insurance Work etc. ... Painting and decorating also undertaken. Free, honest quotes and advice and competitive prices! Michele @ Excel Plastering was recommended to us. The work to re-plaster our hall, stairs and landing (incl. ceilings) was finished to a high standard. Michele is very friendly, he takes great pride in his work and cleared up at the end of each day. The quote was reasonable too. We would highly recommend Excel Plastering and we would use them again. 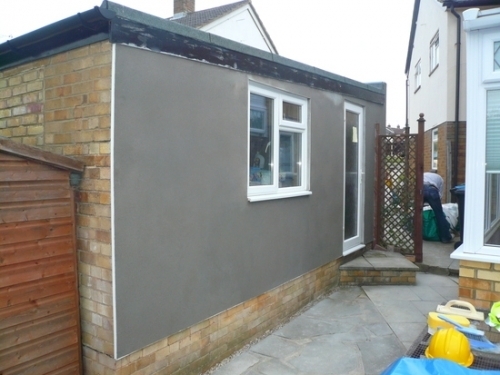 Provided a full quote to board and plaster an extension, great advise, great work, great price (as quoted) and he was extremely reliable and kept in regular contact throughout, would highly recommend! Michele did a fantastic job doing various jobs of replastering and repair for me. He is thoroughly professional in his approach, reliable and trustworthy. I would highly recommend him. This is an honest company that takes real pride in their work. They gave the full description of options available, with pros and cons to each and competitively priced. The pride they take ensures a top notch job from start to finish and given that this is where the customer lives, that is a value much appreciated. We had Michele skim the walls and ceiling in our hallway which we had stripped of textured wallpaper. Well, I thought we had! The perfectionist that he is, Michele undertook further prep work to achieve the best results for us. Even re-hung our radiator. It was only 2 days work but he was extremely hard working and meticulous with his clean-up. We highly recommend him (& have done!). Michele plastering work was of an excellent standard and he kept the house clean and tidy as he worked here for 4 days. I could not recommend him highly enough !!! very friendly and courteous. Michele helped me out in an emergency, my lathe and plaster ceiling came down. He did an excellent job, very fast and professional. I highly recommend Michele and would use him again. Michele advised the solution to one very cold bedroom of ours where there was no insulation between the sloping ceilings and the roof. After v helpful discussions and quotes he took on the job of removing the plasterboard, adding the insulation of our choice, resealing and boarding and Plastering over. His work was top quality, approach professional, excellent after advice, couldn&rsquo;t fault his courtesy and would highly recommend him on both high standard and price.. We now have a lovely hot room and a better insulated house. Michele as Excel was great, friendly, courteous, did a fantastic job of re-plastering after we had a leak causing quite a lot of damage to our walls. Michele was really professional and left the place really neat and tidy after he was finished. Would really recommend Excel and would definitely use again for any future work. Michele undertook plastering for us to cover the artex ceiling in our conservatory. He worked efficiently and quickly and was easy to communicate with. He left thorough instructions afterwards on how to best paint the ceiling. Michele was also very tidy and left the area spotless after the work. Would highly recommend for any plastering work. Not only did Michele do a great plastering job, but he also cleverly solved the problem of attaching the basic plaster board to a large exposed steel beam. Highly recommended. I needed a wall and ceiling plastering. The job was done quickly and professionally. No mess and great job. Would highly recommend. Many thanks. Michele was recommended via a google group. Provided a detailed and competitive quote to skim the ceilings in our living room, dining room and upstairs and downstairs hallway as well as some plastering in our conservatory. He was very reliable, hardworking and always courteous. Work areas always left scrupulously clean after every day's work. Our decorator was also very impressed with the finish. Highly recommended and would definitely use Excel Plastering again. Michele has undertaken two separate jobs for us recently. He is excellent. He's doe a lovely job on what were textured ceilings. also removed and replaced damaged ceiling. He's been reliable and easy to communicate with. He left the place clean and tidy (in fact bathroom looks cleaner than before he came! ).He gave us helpful advice on painting. This is the second time we have asked Michele to do plastering for us and once again he has done a great job. Communication is always easy - he responds to emails quickly and if he says he will turn up at a time, he does! He takes care with carpets etc and covers everything to avoid damage and works quickly but very meticulously. We would happily recommend Michele to anyone who needs a good plasterer! Michele was recommended to us via a Facebook group that we are members of, St Albans U.K house renovations. Michele plastered three of our bedrooms, and we were very pleased with the quality of his work. We would not hesitate to recommend Michele, and we will certainly be using him to do more work in the near future. Excellent work repairing our kitchen walls. Worked hard especially as it was a hot day which reduced the drying time for plaster. Professional service and always kept his promises. Michele is super efficient and a hard worker. He quoted for our work - replacement of part of a ceiling following a leak - within a few hours of his visit. He started work the following week, on time, and even did an extra part of the ceiling at no additional cost. The work was completed to a high standard and the room left completely clean. Highly professional service. Reasonably priced. We would definitely recommend him again. Great job from Excel Plastering, perfect finish, very clean and tidy, quick response to initial inquiry, good price, very reliable, they've been back twice now, recommended. Michele plastered our bedroom, stair way and hall. He did a fantastic job on some really tricky walls and ceilings. The Decorator who came to do the painting work said that he had never seen plastering to such a high standard. We will definitely contact Michele when we have any plastering jobs in the future. Excel Plastering (Michele) just completed the tricky job of plastering a hallway ceiling over a stairwell and a wall. We are very pleased with the quality of the work, the clearing up and the communication. We are happy to recommend. Excel plastering re-plastered my double bedroom. The job was on time and on quality, all communication with them was easy, clear and timely, highly recommended. When it is so difficult to find a real professional in so many of the building trades, I am very pleased to say that in Michelle, I have found one. On contact, we agreed an appointment for him to visit, he arrived on time and promptly provided a competitive quotation: on my acceptance, we agreed a date and he once again arrived on time: carried the work to an excellent standard and cleaned up thoroughly on completion. I would recommend him to anyone. Michele is a true professional and I would highly recommend him. He's trustworthy, highly experienced and hard working but what sets him apart from the rest is his dedication to the job and the attention to detail he gives. His quote was superb - describing all the work he would do and what materials he would need. 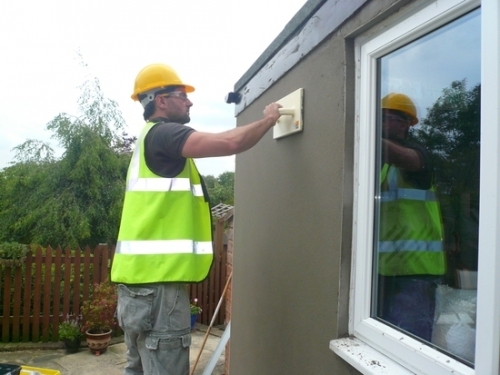 He was punctual, friendly and went over and above our expectations of a plasterer when working on our bathroom. He was a pleasure to deal with and we'll be getting back in to do the kitchen. Excel Plastering recently replastered our landing, hallway and stairwell. The plastering, attention to detail and service was flawless. Great communication from the first moment, right up until the aftercare email and advice on decorating freshly plastered surfaces. We are very happy and would highly recommend. A professional service that is reliable and punctual. Left the place spotless too, thank you Excel Plastering. Excel Plastering plastered my lounge and hall ceiling. The initial contact was prompt, easy to get a quote (which was very reasonable) and the quality of work is excellent. I had it done in July and still looking good. Likely to recommend and use again. I cannot recommend Michele highly enough. From start to finish he was a pleasure to do business with. Punctual, polite, extremely tidy and the quality of his work is outstanding. Will not hesitate to use him again. Wish all trades were this good. Michele takes great pride in his job and his standard of work is excellent ! Nice to have a tradesman who cleans up so well. Nothing was too much trouble, he was extremely helpful with disconnecting all TV and audio equipment. Thank you. Michele was recommended by a work colleague and we are so pleased we took their advice. His attention to detail from the initial quote to the completion of the job was spot on. As well as the superb finish to the ceilings we had re-plastered, I was amazed to see how clean the rooms were when the job was complete. You will have to go a long way to find someone who is as good on price, quality and cleanliness as Michele is. We will be asking him to return to do more work in the near future. Excel were recommended to us by a friend. Great find - we will be using them again. Recently had our nursery plastered by Michele and could not be happier. Out of all the plastering we have had done in our house his work has exceeded far and beyond any other plasterer that we had used. Extremely annoyed that we never found him sooner to do our living room. The walls are flawless!! He arrived on time and covered all of our carpet (even in the hallway and down the stairs)!! He gave us great service before and after the work and gave us great advise on painting afterward. We have already booked him in to do our second bedroom! Very prompt with quoting and thoroughly professional from start to finish. 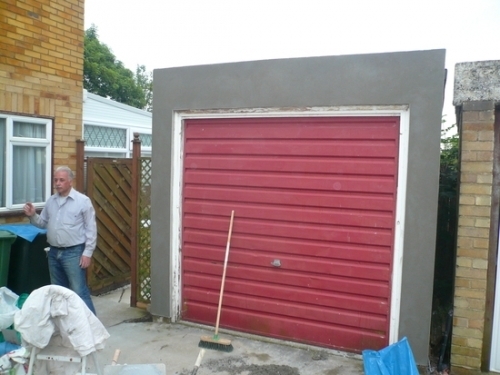 His work has transformed the back of my property with a new rendering which looks excellent. I would not hesitate in recommending Michele and his business. Michele was prompt to quote and prompt to start. Work was very professional and tidy. He even advised on how I could do some stuff myself that I would have been happy for him to bid for. Wouldn't hesitate to recommend. Michele is an extremely rare breed in offering a completely professional package from start to finish. The job was plastering three walls in our kitchen, in parts building up round bits of the solid plaster base left and reboarding and skimming ceiling. Pre commencement of work, always on time to assess job, quoted immediately and in detail (a couple of times as we changed the spec) and quote very competitive. Always on time for the job, worked solidly through and, as stated in one of the other reviews, needed no tea! Plus there is the follow up on decorating the plasterwork. More importantly though, the plastering is great! I wouldn't hesitate to recommend him. Michele was extremely professional. He responded to our initial enquiry quickly and we were impressed with his detailed quotation. He was friendly and polite and worked with complete professionalism. We really appreciated his follow up email which gave us detailed instructions on how to paint the ceiling he had plastered. We will definitely be using him again. Michele skimmed the Walls on our house, and did a great job, very clean nothing was too much trouble, will be using his service again when required. Michele worked with the upmost professional care & attention which is rare to find. He undertook a major replastering project and showed an superb aptitude. Friendly, personable and competitively priced service I can only highly recommend. I will be using his services again. Michele was asked to skim one of our ceilings at short notice. His service was excellent, quality of work top notch and is one of those rare breed of workmen who take pride in their work. On top of this he tidied up completely after himself. Will be using his services again. Michele arrived on time and worked tirelessly all day. His work is perfect and he cleared up very well when he was finished. His quote was very competitive and we were so pleased we have commissioned him to skim all the other ceilings in the house. We will be happy to recommend him to family and friends. Thanks Michele. excellent plaster, hard working, clean and superbly competative rates. the quality of work was perfect and even gave advice on how to decorate afterwards. can't recommend highly enough. will hopefully getting michele to do more work soon. I've just purchused my first house which needed alot of work doing to it including plastering my bathroom ceiling which had water damage and looked a real mess. I got a quote from Excel plastering and decided to go with Michele as the quote was very competitive. I am very glad i did as I'm extremely happy with the work and how clean he left everything once he had finished. Michele's attention to detail is brilliant. I wouldn't hesitate to recommend Excel Plastering to friends and family. Thanks again for an outstanding job!! Excel Plastering was recommended by a friend and I can't stress enough how pleased I am with the whole service from start to finish. Very professional quote which was very competitive and glad to say the actual plastering was excellent. Will definitely use Excel plastering again. Blown awat by the end to end service, I write even as the plaster is drying. The way Michele aquits himself; giving general advice about the property and the actual work that needs to be done, the written quote stating exactly what work needs to be carried out, making clear the process in the event that further work is required, the care and attention to the rest of the house, the aftercare e-mail giving advice on the best way forward. Competitive quote too. Will definitely use again. We needed to replaster our bedroom ceiling and we found Michele's quote was very competitive. We were very impressed with Michele's work and customer care. We would thoroughly recommend him. I cannot recommend Excel plastering highly enough. 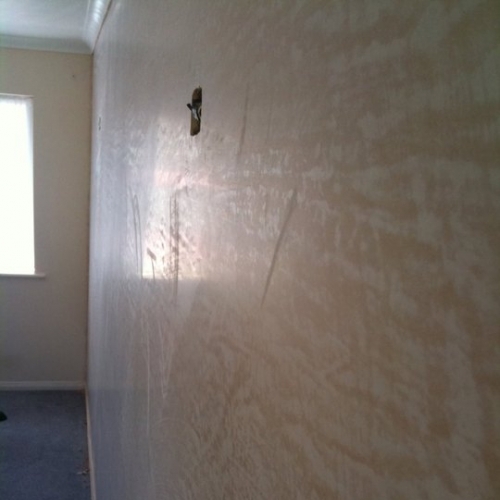 I have renovated a number of properties in the last five years and used many different plasterers. Excel plastering is not only one of the most competitively priced I have come across but also the finish is superb. Over several months I have hired Michele to replaster three bedrooms, a hallway, stairs, landing and living room. Much of the original walls were crumbling and the ceilings were rough aertex so not an easy job. Not only was the workmanship top quality and great value but also Michele works extremely hard to get the job done in good time. I was particularly impressed by his early morning start and the long hours he was prepared to work. After finishing a job the room was always left clean and tidy. Finally, I would like to comment on Michele's clear and professional communication both arranging work and invoicing. Thank you. I had my three bedrooms in my house in Leagrave plastered just a week ago. The plastered walls and ceilings have been done to the highest standard and at an affordable price. I had my three bedrooms in my house in Leagrave plastered just a week ago. The plastered walls and ceilings have been done to the highest standard and at an affordable price. I would recommend Michele without any hesitation what so ever. Michael came to us on the second day of the snow just before Xmas. I was expecting a call to say he could not get to me. He arrived on time and proceeded to work all day, with one very short break. No requests for excessive cups of tea, in fact, not one at all. His work is perfect and he tidied up when he had finished. I would definately recommend this young man and use him again. Thank you Michael. We had a leak in our spare bedroom from the flat above. Excel Plasterers came in and gave us an excellent quote. Their work is of very high standards and they are very clean workers. We are extremely happy with the end result. If we need anymore plastering then Excel are the only company we will call. I needed a newly plasterboarded bathroom ceiling to be skimmed and was recommended Excel Plastering by a colleague. I was extremely impressed from the outset by the communication - they contacted me when they said they would, and were able to provide an extremely competative quote. A very professional approach was followed up by an equally professional job. I would not hesitate to recommend this company to friends and colleagues and will definately be using them again in the future. A very competitive quote was followed by a first class plastering job. We'd removed tiles in downstairs cloak/shower room and great lumps of original plaster fell off. Excel Plastering came along and did a fantastic repair job and then re-skimmed the whole room. It looks superb and the walls are ruler-flat. Excel is very professional in his approach and obviously takes great pride in his work. Highly recommended. I had this company in to re-skim my walls a few weeks ago. Very competitive price quoted and was available to start the work quickly. Arrived on time, kept everything as tidy as possible and great job done. Would not hesitate to recommend this company. Excel Plastering did a fantastic job on a very awkward wall with doorway and other complications. It's transformed the whole room. Very pleasant young professional, clean, tidy and courteous. Excellent price and very reliable. 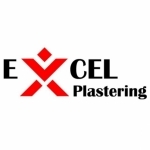 We would not hesitate to recommend Excel Plastering. Excel Plastering did an excellent job in our house in Hemel Hempstead in our little office, hall and cloakroom . Very tricky work with all the pipes. The price was very reasonable and I would like to recommend this compay. I will use them again in the near future. I needed some work doing on an industrial catering BBQ. I found the quote to be very reasonable, cheaper by over Â£50 than other local trades. The work was of extremely high quality and was cleared up very well afterwards. If you want a reasonably priced plasterer who takes exceptional pride in his work, I would highly suggest using this company. Excel Plastering plastered our porch walls & ceiling a few weeks ago. I was extremely impressed. It was a very professional and clean job. The quote was very reasonable too for such a good peice of work. I would definately reccommend this company and would use them again. Done an excellent job at my daughter's kitchen and the same in a flat I manage. I highly recommend them . Excel Plastering was fantastic. Michele did an outstanding job. He was efficient, fast and extremely tidy. I would recommend Excel Plastering. Just to say that work and attention to detail was outstanding. Cost was competertive and i would and have recomended exel pastering to others. Excel plastering re-skimmed the internal walls of my house. Very punctual each day and worked a full day. Kept furnishings protected and cleared all the areas each evening. An exceptional service, excellent work and value for money. I would highly recommend them and would not hesitate to use them again. Michele did an absolutely amazing job on my kitchen ceiling, he arrived on time, worked all day and left leaving the room perfect. A great find. Had ceilings plastered in bathroom, hall stairs and landing and kitchen all to a good standard and at a reasonable cost. 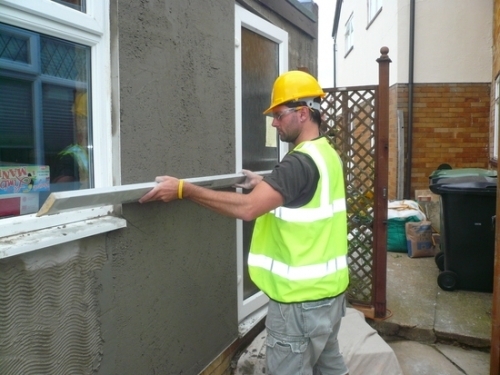 Excel plastering were reliable and carried out work with the minimum amount of inconvenience to rest of house. I have used the services of Excel Plastering on two occasions and have been extremely pleased with the standard of work both times. Michele sets high standards and this is demonstrated in the clean way our property was left at the end of each job. I have recommended Excel Plastering to a couple of work colleagues who have also been extremely pleased with his work. Michele (Excel Plastering) replastered sections of our kitchen. He provided a competitive, detailed quote and carried out the work quickly and efficiently, to a very high standard. We found him to be extremely professional and pleasant. His follow-up e-mail with advice on painting over the plasterwork was very much appreciated. Michele helped me out of a tight spot after being let down by my usual Plasterers. He visited the job in question promptly and I received an emailed quote that afternoon. It was competitive and informative. He did a great job for me and I have no qualms in recommending him to anyone. I will undoubtedly be calling on his services again. Molto Bene and Grazie Michele.